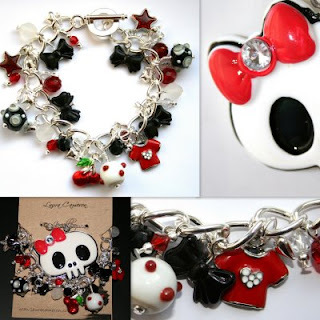 I've just popped this jewellery order into the post for a young lady's Birthday - the mission was skulls (but girly ones! ), bows, cherries and Manchester United. Let's hope she likes it! It bears striking resemblance to the first charm bracelet I ever made which was made for the Aunt of the Birthday girl who commissioned this piece, who wouldn't want to be as cool as Auntie Kath!? never thought I'd call skulls pretty but those are!